Organisations recruit personnel to address skill and competency requirements related to the projects that they are likely to undertake. This can be a challenging endeavour. Ask any HR professional. Depending on the field, finding a good match can be extremely hit and miss due to uncertainty built into an organisation, industry or operational context. Take post-disaster reconstruction. Organisations undertaking projects in a post-disaster context can face an extremely volatile and fragmented situation, with unique and complex problems arising quick and fast. It is very difficult to even characterise, prior to a scenario arising, what an appropriate professional might be to cover the range of skills and behaviours necessary. Since 2007 I have been researching competency in non-government organisations (NGOs) relating to post-disaster reconstruction projects. The project has taken me to South Asia and allowed me to interview dozens of NGO project managers. My field work inspired the overall concept and allowed me to generate the essential data for a system that could simulate the likely performance of post-disaster project managers in disaster scenarios. In 2014 I took the concept further and designed a beta software tool (with a lot of help from my friends). We are delighted to have just published a paper in Disaster Prevention and Management, describing the system development process. 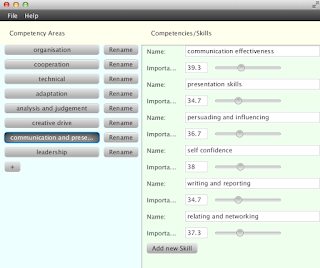 The tool allows administrators a high degree of functionality; creating project manager, disaster scenario and competency variables and values. As a user of the tool, the options are more limited. You can simulate various disasters against personnel profiles and calculate likely performance. At the moment the tool is a bit buggy and limited by my field data, but I'm excited about what the future holds for the idea. Watch this space for the next Phase (anyone want to fund it?!). The key message is that if we have the knowledge to reduce the risk of deploying the wrong people to deal with disasters, we must use that knowledge. This research will help us to develop tools that add significant value for organisations; particularly those that understand the need for 'horses for courses', in a disaster context and potentially in any project based activity.